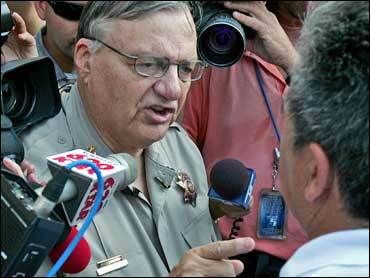 Latino leaders and faith-based organizations want Maricopa County Sheriff Joe Arpaio to disconnect the hotline he created for people to report information about undocumented immigrants, saying it raises the chance of racial profiling. But Arpaio said Wednesday that he won't disconnect the hotline and stressed that deputies would investigate people only if authorities had probable cause. The hotline began last Friday and has received about 300 messages, which include tips about family and friends, employment, day laborers, drop houses and crank calls. Arpaio said officials are analyzing the tips and officials have not acted on any of the calls. "There's nothing unconstitutional about putting up a hotline," Arpaio said, pointing out that U.S. Customs and Border Protection, and Immigration and Customs Enforcement have similar hotlines. The hotline is part of an expanded immigration enforcement plan Arpaio unveiled last week that also includes sheriff's deputies cross-trained to enforce immigration law. Some Latino advocacy groups will launch a hotline of their own to take tips from people who believe they've been unfairly reported to Arpaio's hotline, said activist Mary Rose Wilcox, a Maricopa County supervisor. Meanwhile, some faith-based organizations are circulating a letter among church leaders and members that decries Arpaio's hotline.